There was an enjoyable programme about Arnold Bennett on Radio 4 yesterday (still available on iPlayer). Deborah Moggach and Giles Brandreth gave a lively account of his life and talked enthusiastically about his novels, agreeing that The Old Wives’ Tale was the best (which is fair enough, though I have an especial fondness for Riceyman Steps and The Pretty Lady – and for The Card, too). I’d disagree with them on just a couple of points. First of all, they said that nobody reads Bennett any more. Not quite true, as can be seen from the Reading 1900-1950 discussions of his novels. And from the conferences organised by the Arnold Bennett Society. Then they seemed to think it a mystery why Bennett refused the offer of a knighthood. I don’t think it’s a mystery at all. Plenty of other writers (such as Kipling) refused honours at the time, taking the view that writers should be independent of the state, and that such official endorsement might limit their freedom to be controversial. The literary knights of the period tend to be the second-rankers (Pinero, Barrie, Hall Caine). After writing a play whose hero argues that to accept an honour would be dishonourable (because he feels that his own name has been added to the list merely because it would look bad if all the proposed honorees were crooks or shysters) Bennett was hardly in a position where he could comfortably accept a gong. This entry was written by George Simmers and posted on April 30, 2014 at 5:42 pm and filed under History, novels, Theatre. Bookmark the permalink. Follow any comments here with the RSS feed for this post. Post a comment or leave a trackback: Trackback URL. I don’t think they let those of us across the pond listen to iPlayer so did you notice if they mentioned him being an editor of a newspaper or magazine called ‘Woman?’ Thanks! They did indeed – and pointed out that women’s magazines often provided a first step into the literary world for young men of promise – citing Oscar Wilde as an example. Actually you can listen to BBC audio here in the US (you can’t access BBC video, though). A very nice listen, though I was taken aback when the declined knighthood was discussed. I think you’re spot in writing that the literary knights of the period tend to be the second-rankers. Sir Gilbert Parker and Sir Charles G.D. Roberts are the first names that come to this Canadian’s mind. 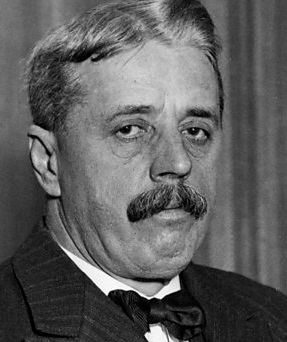 Thanks for posting the link to the Radio 4 programme devoted to Arnold Bennett. It did well in giving a sense of what is so attractive about his work. Hieing off to Project Gutenberg on the strength of it, I discovered that Bennett’s ‘The Human Machine’ has currently the second-most number of downloads after ‘How to Live on 24 Hours a Day’. It was published in 1908 – the same year as the Old Wives Tale – and is typically very amusing (in case anyone should fear a doomy H.G. Wellsian exploration of human evolution).